Not many think of SF State as the perfect setting for a horror movie or a true ghost story. Eric Michael Jones and Catherine Anne Copeland were found dead in Copeland’s room on the third floor of Mary Ward Hall in 1994. Jones and Copeland had dated briefly, but had broken up. According to an LA Times article, Jones shot Copeland and then turned the gun on himself. Eighteen years later, their ghosts are said to haunt the third floor. “The first week people were telling me it’s haunted, but I haven’t noticed anything out of the ordinary. I feel normal in there,” said Alejandro Adame, 18, who lives in the infamous dorm room. The rumors of the supernatural seem unreasonable to Adame, who is double majoring in international relations and French. The murder-suicide that occurred in his room doesn’t bother him, but sometimes his guests become unnerved after hearing the tale. “People are like, ‘Oh my gosh, I’m so scared being in here. What if something happens?’” Adame said. English major Steven Tindle lives across the hall from Adame. San Francisco is the ninth most haunted city of America, according to the Huffington Post, and SF State has its fair share of stories. During the summer before moving into Mary Park Hall, Melissa Covert read about the hauntings on Facebook. Since she was already interested in the supernatural, this post caught her attention. The board game has been traditionally used to contact spirits and has come under scrutiny due to its alleged demonic ties. 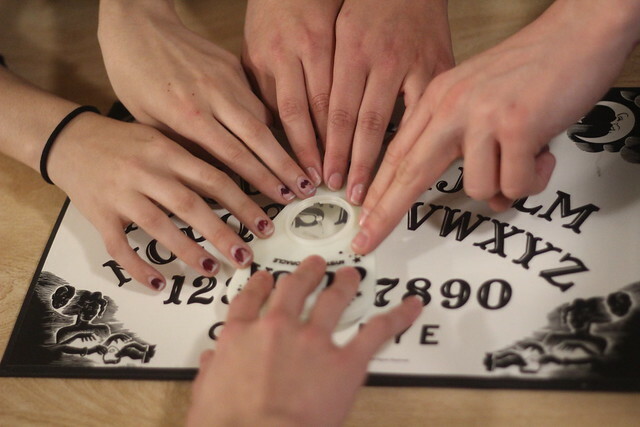 Covert and a friend eventually gathered enough courage to take their Ouija board to the third floor of Mary Ward Hall. Even though Covert didn’t have any luck, she still believes it’s possible to get in touch with a ghost. “Einstein stated that energy cannot be created or destroyed, it can only be changed from one form to another. So when people die, their energy has to go somewhere, right?” Covert said. University student Grace Bigler is trying to assemble an occult group on campus focused on the teachings of Aleister Crowley. Crowley was a British Occultist in the 1900s. He was the inventor of a religious philosophy of occultism called Thelema, which Bigler practices. For Bigler, the religion is a way to pause and become more like her true self. “I talk to people about it openly because it’s part of who I am. But if it’s a Jehovah’s Witness on my doorstep, I’m not gonna really go explain what it is because they have an agenda and don’t want me to be doing what I’m doing,” Bigler said. Not all students view the supernatural in a serious fashion. “I think it’s silly, but cool at the same time — my room’s popular! It makes it feel special,” Adame said. Didn’t a student or two die when their Towers dorm had a toxic mold problem a few years back? You’d think that would be a good place to look for ghosts. I have a better story. I lived on the 1st floor of Mary Park Hall back in the Fall of 1996. I returned to the same floor of Mary Park Hall in the Fall of 1998 due to housing issues. I had a nightmare my first semester there. When I returned in 1998, the new resident of my old room had the same nightmare (but two years later) on the same week, the same month, the same time, but different years. I was there living in my dorm room on that night that the awful tragic event took place. March 7, 1994. No one knew what happened after we heard gun shots, there were rumors spreading fast but we didn’t have the facts. It wasn’t until late that night, we found out and everyone was in shock. It stunned the residential community. The memories still come back to haunt me about that night every March when I am reminded about it. does anyone know what room it is? Do you know what room it was?? Hopefully, my book will be able to shed some light.